We use highly sophisticated equipment and methods, including Hot Water Extraction and Low-Moisture methods, to deep clean your carpets and to thoroughly clean your upholstery. In fact, we use custom-built high-performance dirt extraction tools that most carpet cleaners have never seen before! Residential Maid Cleaning Services that we tailor to your specific needs. Tim and Amy personally train each employee and supervise them on each job in all our services. We use "green" cleaning products that are non-toxic and environmentally friendly. We are the best in the Southwest Montana area, and we provide references to prove that nobody compares to our service! If you are looking for a great experience, we are the ones who you need to make that happen! Exceptional Customer Service and Professionalism: Put Us to the Test!! 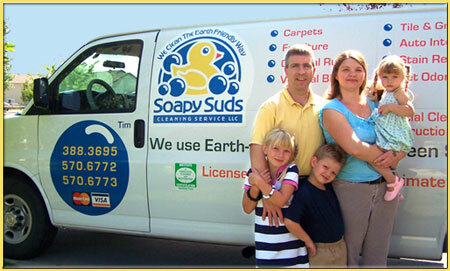 Soapy Suds Cleaning Service believes in the highest degree of professionalism and expertise. We are certified by the IICRC(# 120273 ) to assure you the highest quality carpet care.